The primary runoff for outgoing state Sen. Troy Fraser’s seat has gone fully negative. State Rep. Susan King, R-Abilene, and Travis County eye surgeon Dawn Buckingham are trading barbs in public appearances left and right. Travis County eye surgeon Dawn Buckingham, left, and Republican state Rep. Susan King of Abilene, right. The primary runoff for outgoing state Sen. Troy Fraser’s seat has gone fully negative. 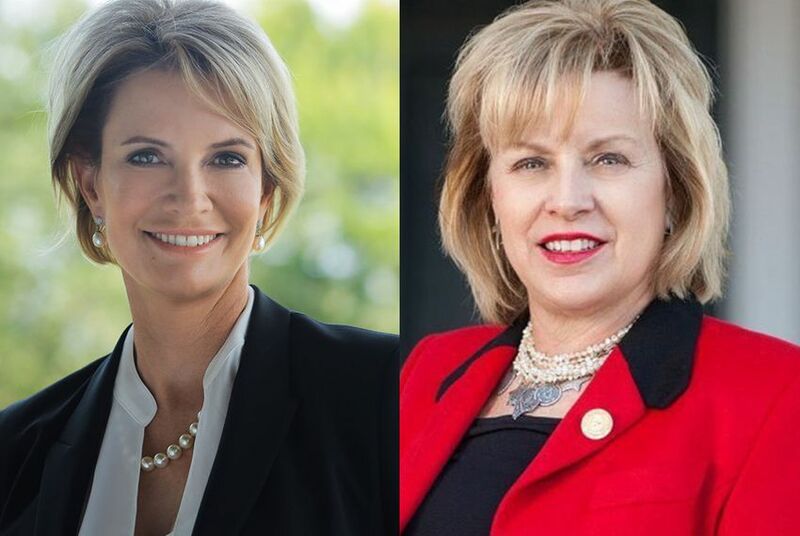 In the final weeks of the campaign, state Rep. Susan King, R-Abilene, and Travis County eye surgeon Dawn Buckingham are trading barbs in public appearances left and right, criticizing each other over issues such as an unreleased 911 call, ties to a for-profit college, claims of rural credibility and their respective political records. In this sprawling district — one that spans roughly 20,000 square miles, from the Hill Country to Abilene — King has billed herself as an effective lawmaker with a love of guns, the support of veterans’ groups and deep ties to rural Texans. She has sought to paint Buckingham as a Travis County suburbanite who in past years made political donations to Democrats. King’s campaign team has also scrutinized Buckingham’s past position on the board of governors of the for-profit National American University, which has campuses in Texas and has been criticized as “predatory” by a veterans’ group. Buckingham, meanwhile, has run as a conservative reformer seeking to move the Senate chamber farther to the right. She has attracted the support of high-profile Republicans including former Gov. Rick Perry, as well as Tea Party stalwarts such as state Rep. Jonathan Stickland, R-Bedford. Buckingham has accused King of being a liberal in disguise who supports expanding government programs. Buckingham’s campaign manager has also publicly questioned why King sued to block a 911 call she made in Abilene last year from being released to the public. Last year, the lawmaker temporarily withdrew from the Senate race to seek treatment for depression. King and Buckingham both declined, through spokesmen, to be interviewed for this story. But the fireworks were on full display at a recent televised debate in Abilene. A moderator first asked each candidate what she would do about the city’s State-Supported Living Center, which houses people with profound disabilities. The center is Abilene’s fourth-largest employer, according to the local chamber of commerce. Then the candidates let loose on each other. “I feel it’s a little disingenuous for my opponent to say that she supports the State-Supported Living Centers, as she was one of the forces behind the broad recommendation to close the centers, including Abilene,” King said, referring to Buckingham’s appointment to the Sunset Advisory Commission. That commission evaluates whether state agencies are operating efficiently enough, and in 2014 made a recommendation to close down some of the state-supported living centers because of infrastructure problems. Buckingham said the commission’s proposal never directed the Abilene center specifically to close. The two candidates also clashed over identity. Asked how she would improve life for rural Texans, King made mention of the Senate district’s “very unusual” makeup that includes large swaths of rural land with “a suburban area at [its] end,” an apparent reference to Buckingham’s residence in Travis County, near Austin. “Don’t be confused by lies and accusations that the King campaign continues to throw,” Buckingham told the audience. She said she had a “very rural heart,” lives in a small town and was endorsed by the Texas Farm Bureau. Sam Martin, a professor of political communication at Southern Methodist University, said that while suburban and rural voters both tended to align with the Republican Party, the 2016 presidential race had revealed significant rifts between them. “In some ways this is a microcosm, I would guess, of what’s happening on the macro level with the Republican presidential nomination," she said. Martin said it was not uncommon for political strategists in deep-red districts to try to “tap into that resentment” voters might feel along geographic or class divisions. The negative rhetoric is a notable departure from the March primary race, which originally featured six candidates. At times, those contenders appeared to struggle to make a name for themselves on crowded stages. King once joked she had run into voters on the campaign trail who had mistaken King and Buckingham, the two female candidates in the race, for each other. Two of the other four candidates have endorsed in the runoff: Jon Cobb, the third-place finisher, is supporting King, and Ryan Downton, the sixth-place finisher, is supporting Buckingham. Downton said in a statement it was "very clear" that Buckingham would "fight for the values that are important to conservatives across the district." Cobb, on the other hand, told the media outlet Quorum Report that he had endorsed King because Buckingham had given "personal money to the most liberal Democrats that hate our conservative beliefs," referring to donations Buckingham made between 2005 and 2012 to Austin Democrats such as state Sen. Kirk Watson and state Rep. Donna Howard. King placed first in the original contest, with 27 percent of the vote. Buckingham finished second with 25 percent. The winner of the Republican runoff on May 24 will face Democratic candidate Jennie Lou Leeder in November. The Texas Farm Bureau and Southern Methodist University have been financial supporters of The Texas Tribune. A complete list of Tribune donors and sponsors can be viewed here.